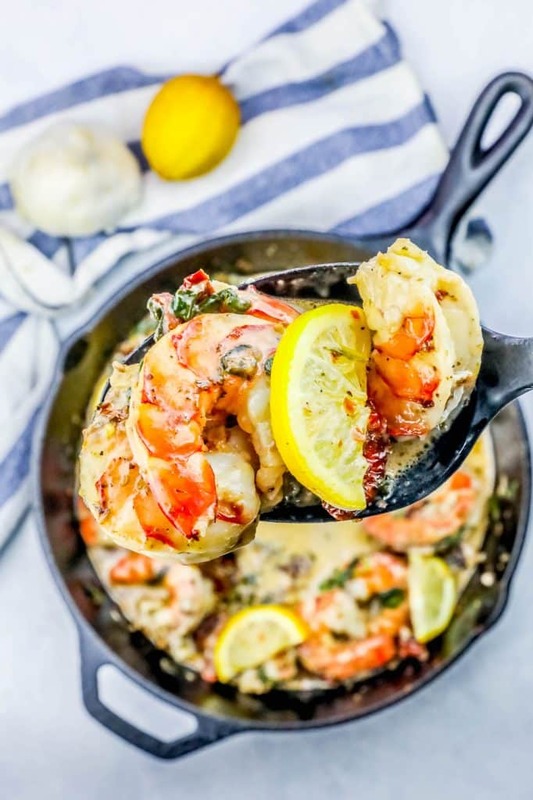 One Pot Creamy Shrimp Florentine Skillet is a deliciously easy dinner everyone loves! 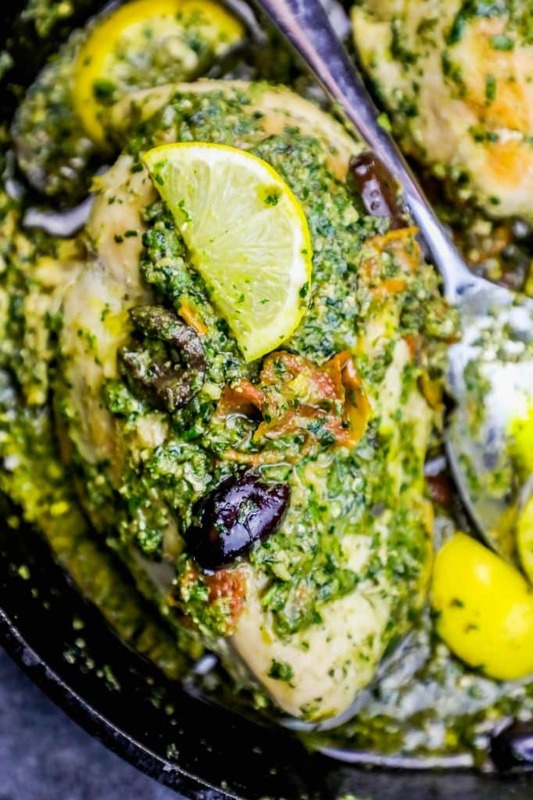 Perfect for family night or a dinner party in under 20 minutes. 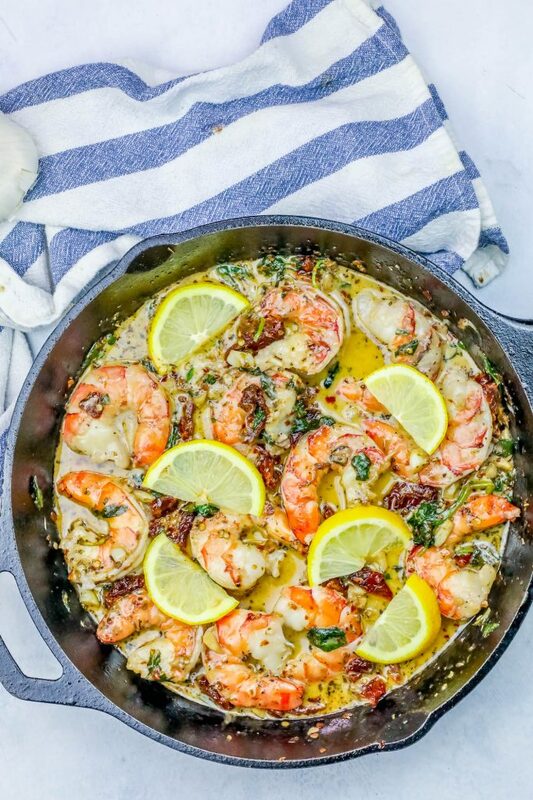 I love creamy, garlicky skillet meals that are done quick- and I really love skillet shrimp dinners. 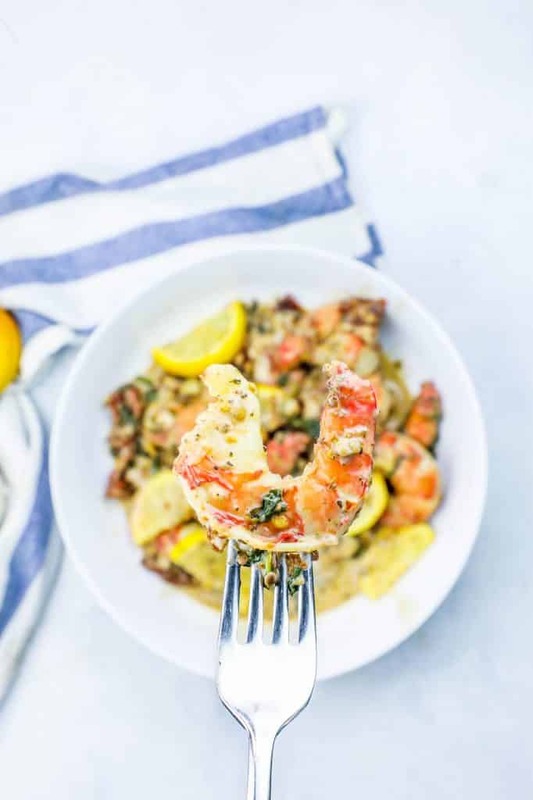 My husband and I recently started a very low carb diet – but were craving a delicious, creamy comfort food – that our kids would love and could be poured over rice for them, too – and this shrimp was a major knockout. It’s garlicky, salty, and sweet – with a little lemon and spicy kick. Plus I get to serve shrimp with spinach, and for once, nobody complains! 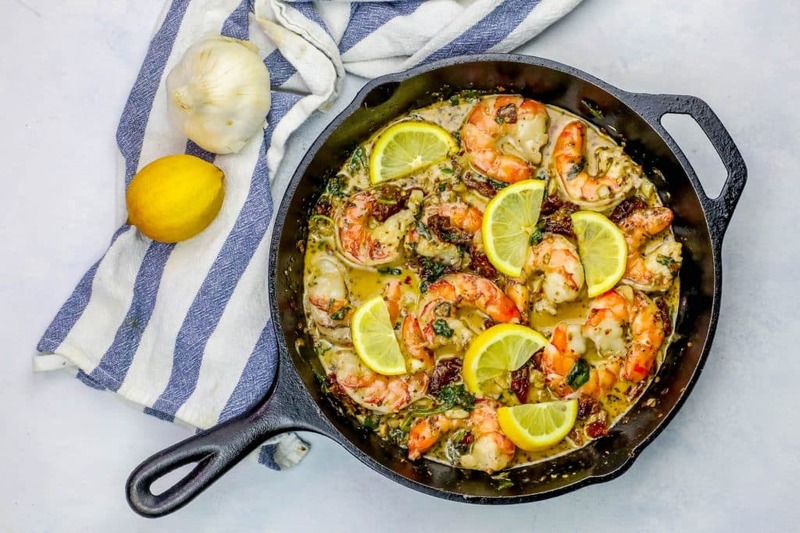 This One Pot Creamy Shrimp Florentine Skillet is so delicious, I don’t even bother putting it over pasta – I just eat it right out of the pan! Serve over rice for a creamy, delicious seafood scampi the whole family will love. Serve with fresh tossed linguine or fettuccine as a classic shrimp florentine pasta. 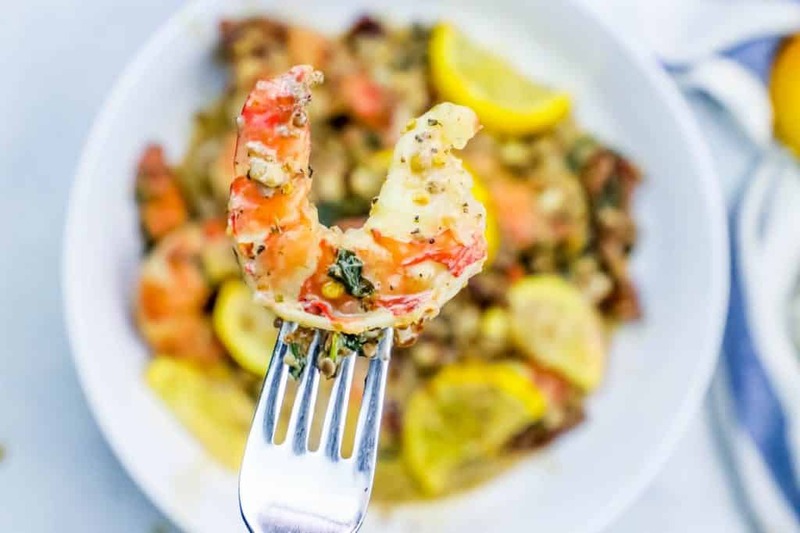 Zucchini noodles pair perfectly with this shrimp for a low carb pasta that is deceptively indulgent. Eat shrimp alongside grilled vegetables – or just dig right in! 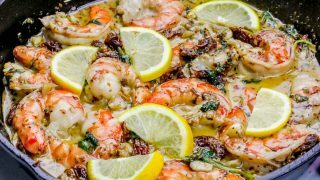 -Resist the urge to overcook your shrimp – shrimp takes on a gummy texture when overcooked that is anything but pleasant. Shrimp should be cooked to when they are just all pink, and then removed from the heat. 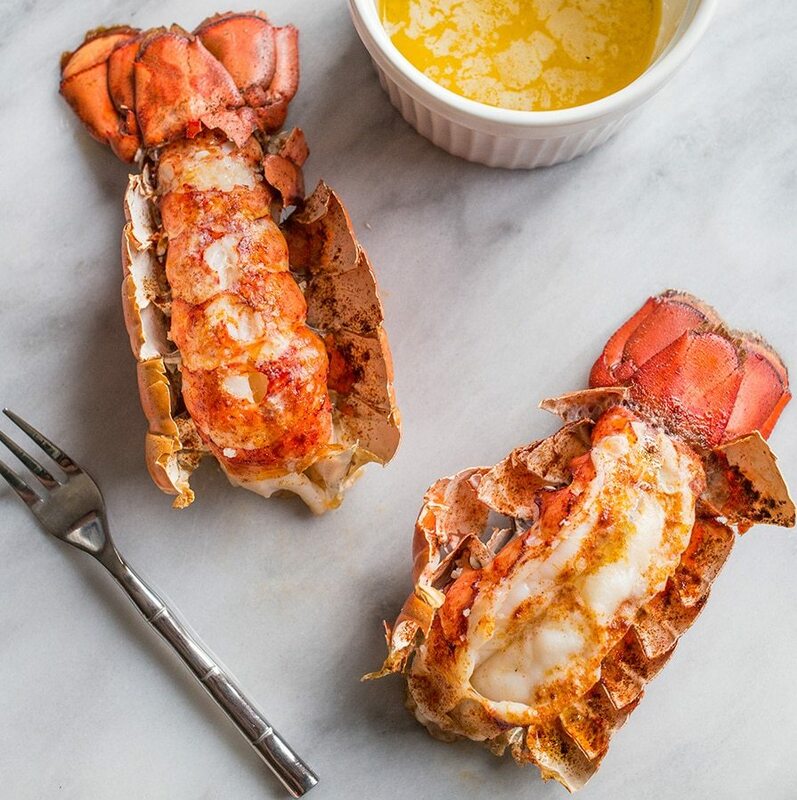 -Lowering the heat under the pan when adding cream helps the sauce not break instantly and take on a thick, creamy texture. If saving as leftovers, remove lemons from sauce and discard. The lemons break down and become really bitter when left overnight. There will still be plenty of lemon flavor in the dish if you get rid of them before storing! In a large, heavy pot, heat butter until melted. Add garlic and sautee on medium until very lightly browned, about 4 minutes. Add in sundried tomatoes, cook until softened and garlic is browned. Pour white wine over garlic and tomatoes, let reduce by half, about 5 minutes. Cook spinach in when wine is reduced, and let wilt. Turn off heat, and pour cream in (pouring the cream in when its super hot will break the sauce). Return heat to medium and stir well. Stir in shrimp, let get pink on one side and then flip. 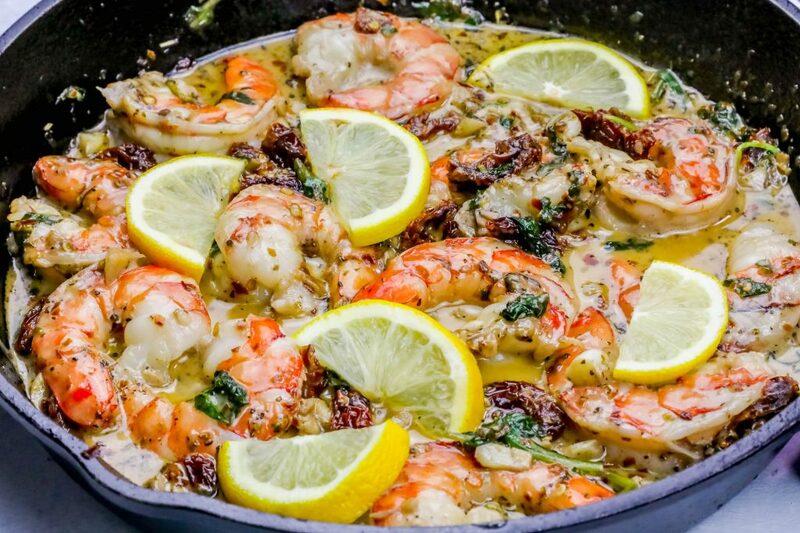 Add lemons over the shrimp, let sauce reduce by half. When shrimp is opaque, remove from heat and serve over pasta, rice, vegetables - or on its own! What if I don’t have white wine?? ? 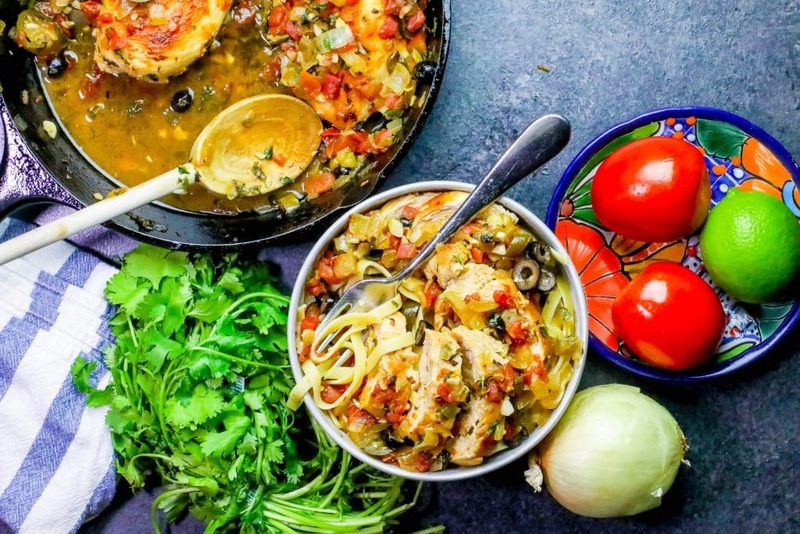 You can use chicken stock – I love the flavor of white wine, but stock will work just fine. How can’t wait to try his. 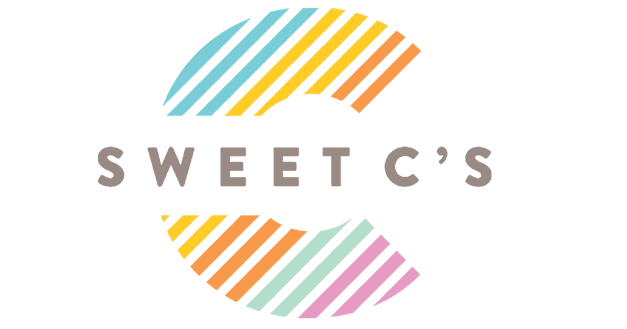 Sounds great for those of us who are on low carb. 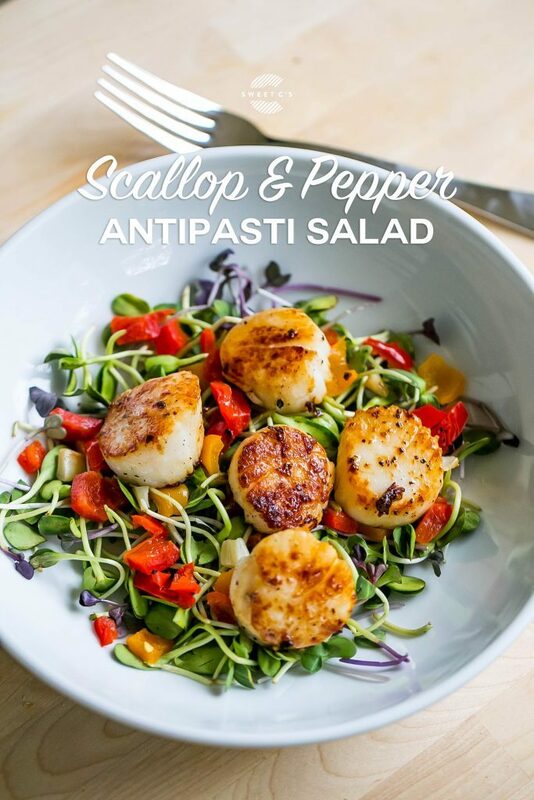 Mary – my husband and I are doing SO well with low carb – and this was one of my favorite meals yet!